Finally all the parts of the NC393 prototype are tested and we now can make the circuit diagram, parts list and PCB layout of this board public. About the half of the board components were tested immediately when the prototype was built – it was almost two years ago – those tests did not require any FPGA code, just the initial software that was mostly already available from the distributions for the other boards based on the same Xilinx Zynq SoC. The only missing parts were the GPL-licensed initial bootloader and a few device drivers. Getting to the next part – testing of the FPGA-controlled DDR3 memory took us longer: the overall concept and the physical layer were implemented in June 2014, timing calibration software and application modules for image image recording and retrieval were implemented in the spring of 2015. When the memory was proved operational what remained untested on the board were the sensor connections and the high speed serial links for SATA. I decided not to make any temporary modules just to check the sensor physical connections but to port the complete functionality of the image acquisition, processing and compression of the existing NC353 camera (just at a higher clock rate and multiple channels instead of a single one) and then test the physical operation together with all the code. Image compressors get the input data from the external video buffer memory organized as 16×16 pixel macroblocks, in the case of color JPEG images larger overlapping tiles of 18×18 (or 20×20) pixels are needed to interpolate “missing” colors from the input Bayer mosaic input. As all the data goes through the buffer there is no strict requirement to have the same number of compressor and image acquisition modules, but the initial implementation uses 1:1 ratio and there are 4 identical compressor modules instantiated in the design. The compressor output data is multiplexed between the channels and then transferred to the system memory using 1 or 2 of Xilinx Zynq AXI HP interfaces. This portion of the code is also based on the earlier design used in the existing NC353 camera (some modules are reusing code from as early as 2002), the new part of the code was dealing with a flexible memory access, older cameras firmware used hard-wired 20×20 pixel tiles format. Current code contains four identical compressor channels providing JPEG/JP4 compression of the data stored in the dedicated DDR3 video buffer memory and then transferring result to the system memory circular buffers over one or two of the Xilinx Zynq four AXI HP channels. Other camera applications that use sensor data for realtime processing rather than transferring all the image data to the host may reduce number of the compressors. It is also possible to use multiple compressors to work on a single high resolution/high frame rate sensor data stream. Another module – 4:1 compressor multiplexer is shared between multiple compressor channels. It is possible (defined by Verilog parameters) to use either single multiplexer with one AXI HP port (SAXIHP1) and 4 compressor inputs (4:1), or two of these modules interfacing two AXI HP channels (SAXIHP1 and SAXIHP2), reducing number of concurrent inputs of each multiplexer to just 2 (2 × 2:1). Multiplexers use fair arbitration policy and consolidate AXI bursts to full 16×64bits when possible. Status registers provide image data pointers for last write and last frame start, each as sent to AXI and after confirmation using AXI write response channel. All that code was written (either new or modified from the existing NC353 FPGA project by the end of July, 2015 and then the most fun began. First I used the proven NC353 code to simulate (using Icarus Verilog + GtkWave) with the same input data as the one provided to the new x393 code, following the signal chains and making sure that each checkpoint data matched. That was especially useful when debugging JPEG compressor, as the intermediate data is difficult to follow. When I was developing the first JPEG compressor in 2002 I had to save output data from the various processing stages and compare it to the software compression output of the same image data from the similar stages. Having working implementation helped a lot and in 3 weeks I was able to match the output from all the processing stages described above except the event logger that I did not verify yet. Then it was the time for translating the Verilog test fixture code to the Python programs running on the target hardware extending the code developed earlier for the memory controller. The code is able to parse Verilog parameter definition files – that simplified synchronization of the Verilog and Python code. It would be nice to use something like Cocotb in the future and completely get rid of the Verilog to Python manual translation. All the problems I encountered while trying to make hardware work turned out to be reproducible (but no always easy) with the simulation and the next 3 weeks I was eliminating then one by one. When I’ve got to the 51-st version of the FPGA bitstream file (there were several more when I forgot to increment version number) camera started to produce consistently valid JPEG files. At that point I replaced a single sensor front end with no lens attached (just half of the input sensor window was covered with a tape to produce a blurry shadow in the images) with four complete SFE with lenses simultaneously using a piece of Eyesis4π hardware to point the individual sensors at the 45° angles (in portrait mode) covering 180°×60° FOV combined – it resulted in the images shown above. Sensor color gains are not calibrated (so there is visible color mismatch) and the images are not stitched together (just placed side-by-side) but i consider it to be a significant milestone in the NC393 camera development. Almost at the same time Alexey who is working on SATA controller for the camera achieved an important milestone too. His code running in Xilinx Zynq was able to negotiate and establish link with an mSATA SSD connected to the NC393 prototype. There is still a fair amount of design work ahead until we’ll be able to use this controller with the camera, but at least the hardware operation of this part of the design is verified now too. And then make the first batch of the new cameras that will be available for other developers and customers. 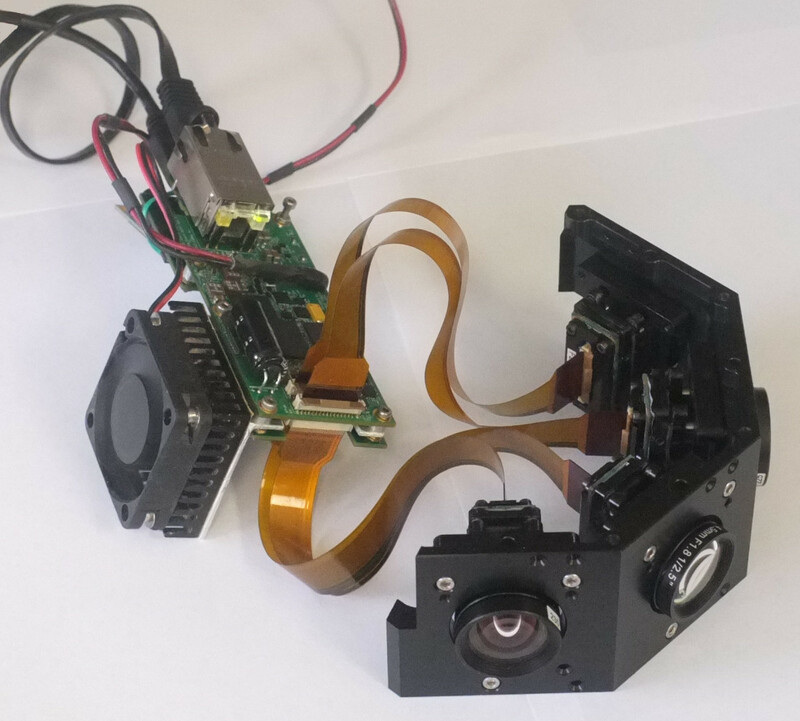 We also plane to make a new sensor board with On Semiconductor (former Aptina, former Micron) MT9F002 – 14MPix sensor with the same 1/2.3″ image format as the MT9P006 used with the current NC353 cameras. This 12-bit sensor will allow us to try multi-lane high speed serial interface keeping the same physical dimension of the sensor board and use the same lenses as we use now.